MRI provides luminal, edema, & scar images which assist in the Electrophysiological (EP) treatment of ventricular and atrial arrhythmias]. Until a complete set of MR-compatible EP-devices is available, patients must be repeatedly moved between the MRI, where imaging and mapping occur, to the conventional EP suite, where puncture, navigation and Radio-Frequency Ablation occur. MRI-conditional voltage-based electroanatomic mapping (EAM) would permit efficient MRI-guided EP, with registration-free continuation outside MRI, utilizing X-ray, Intra-Cardiac-Echo (ICE) and EAM guidance. A 1.5T EnSite™ Velocity™ cardiac mapping system, a voltage-based EAM available from St. Jude Medical was previously validated [1, 2]. Multiple-catheter EAM (localization and intra-cardiac electrocardiogram (EGM) measurement) inside a 3T MRI requires modifications. An EnSite™ Velocity™ system was connected to an electronic switching circuit that prevents induced MRI gradient-ramp noise from corrupting ECG fidelity. Electrode tracking is preserved with software blanking. The system also included RF-filtered electrical lines, modified EnSite™ NavX™surface electrodes, and gold electrode EP catheters . Trans-septal punctures were made in 2 intubated swine under X-ray & ICE guidance. Millar catheters were placed in the aorta to monitor Invasive Blood Pressure (IBP). The swine were moved to a Siemens 3.0T MRI suite equipped with an EnSite™ Velocity™ system. A 12-lead MRI-compatible ECG  was also used. 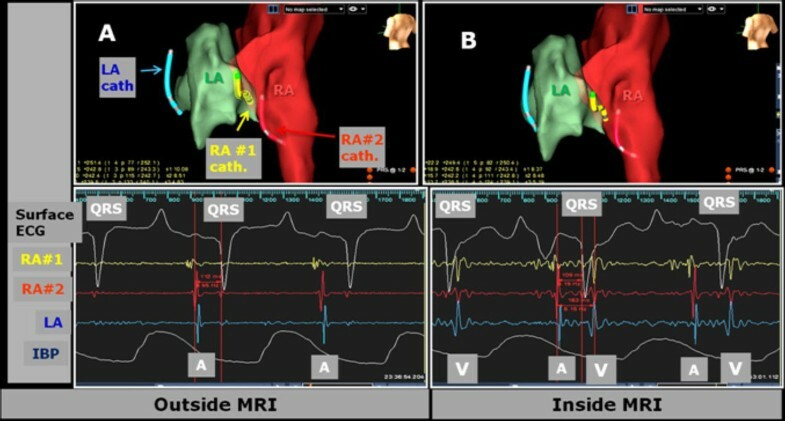 Three EP catheters, with 4 voltage-tracked electrodes each, were navigated simultaneously inside the MRI to acquire EAM of the heart's left & right sides, with a coronary sinus catheter for physiological reference. Imaging & EAM were performed simultaneously (Figure 1). To measure the EnSite™ Velocity™ system's catheter tracking accuracy during MR imaging, catheters were navigated to specific anatomic regions, and the change in location was observed during imaging over 10 sec increments. EAM maps acquired (A) outside MRI versus (B) inside the 3T MRI. Three simultaneously navigated catheters (LA, RA#1 and RA#2) are shown. Upper images show EAM maps. Lower images show surface ECG, intra-cardiac EGM (RA#1, RA#2 and LA catheter tip electrodes), as well as intra-aortic IBP traces. QRS denotes start of ECG cycle. V and A denote Ventricular and Arterial signals, respectively. A strong superimposed ventricular signal was observed on all atrial intra-cardiac ECG traces (extreme-right red vertical line in (B)) acquired inside the MRI, a result of the strong 3T Magnetohydrodynamic voltage. EAM & catheter navigation in swine were performed both inside & outside the MRI at >20 frames-per-second without re-registration (Figure 1). Imaging was conducted simultaneously with tracking, with catheter position stable (+1 mm) during imaging in TR>32 ms sequences. Median catheter electrode locations changed by < 0.5 mm between inside and outside MRI. An added ventricular signal was observed on intra-MRI atrial EGMs (Figure 1B), due to Magnetohydrodynamics. IBP detected a cardiac event (Figure 2), followed by successful CPR & defibrillation in the MRI suite. MRI Image quality reduction was < 5%, although catheter artifacts during SSFP were excessive (Figure 3), requiring catheter redesign. Surface ECGs, EGMs (Intra-cardiac ECGs) and IBP traces taken before, during, and after successful resuscitation (compression and defibrillation) of a cardiac event which occurred inside the MRI. The cardiac event was recorded during mapping of the base of the swine's Left Atrium. The three EP catheters (LA, RA#1 and RA#2) were passively detected in multi-slice SSFP cine images as a result of over-tipping (red and yellow arrows) on the catheter shaft as well as susceptibility artifacts (blue arrows) at the tip. 3T MRI-conditional voltage tracking allows simultaneous catheter tracking & MR imaging, permitting registration-free EAM inside & outside MRI during EP procedures. NIH U41-RR019703 & R03-EB013873-01A1, AHA 10SDG261039.